← SAN FRANCISCO SILENT FILM FESTIVAL Day 2: Amazing Tales from the Archives, The First Born, Tokyo Chorus, The Patsy, The Golden Clown. Yesterday’s programming was perhaps the most phenomenal of the entire festival thus far, and consisted of some of the best offerings I have ever seen here. With an Academy Award-winning animator and a full Balinese gamelan ensemble highlighting the day, this was one of the most unique and memorable days in the entirety of my experience at the San Francisco Silent Film Festival. One of the things I love about the San Francisco Silent Film Festival is its commitment to diversity. It is monumentally easy to fill a program with solely American films with American directors and casts, and that seems to be the modus operandi of many American for-profit festivals around the country. But the San Francisco Silent Film Festival, a non-profit company, has much greater freedom and a wide open mind, preferring to provide the viewer with a holistic view of silent film, ranging from American crowd-pleasers to obscure international titles unseen for decades. Much of yesterday’s program represented the diversity that is so important to the San Francisco Silent Film Festival, with 4 foreign titles from Bali, France, Russia, and Germany. But the first presentation of the day was the sheer definition of a crowd-pleaser. Academy Award-winning animator John Canemaker (“The Sun and the Moon”), who is now the head of animation at NYU, painted a complex and elaborate portrait of animation pioneer Winsor McKay, considered to be one of the fathers of modern animation. From his early cartoon drawings to his political work for the Hearst newspapers, Canemaker delivered a heartfelt tribute complete with rousing audience participation. When he discussed McKay’s creation of Gertie the Dinosaur and his incorporation of the moving cartoon into his vaudeville act, he asked the audience to do what McKay’s audiences did–talk to the dinosaur and give her instructions. The crowd went wild with enthusiasm. Gertie the Dinosaur, animated by Winsor McKay. This presentation on Winsor McKay was likely the very best presentation I have ever seen at the San Francisco Silent Film Festival. Informative, funny, and engaging, Canemaker piqued my interest in a subject on which I am often lukewarm (animation has never been a primary interest of mine). His book about Winsor McKay, for sale at the festival, sold out within minutes of the end of his presentation, and I made the point to go up to him while he was signing books to tell him how blown away I was. San Francisco Silent Film Festival take note–have John Canemaker back every year! Next on the program was one of the major events of the festival–the world premiere screening of Fairbanks’ The Half Breed, restored by the San Francisco Silent Film Festival, the Cinémathèque française and the Library of Cogress. Based on the presentation given Friday morning, I was very excited for this movie. A tragic tale commenting on the rampant racism of 1849 California, The Half Breed is a film ahead of its time.Fairbanks plays a man with a Native American mother and a white father, dealing with the prejudices of white society. The most interesting part of the film for me was watching it as it passed through the projector for the first time, having seen the presentation on its restoration on Friday morning. Given that the film is nearly 100 years old, the restoration was beautiful. Some parts were so badly damaged that they could not be repaired, and taking them out would ruin the continuity. Thus, certain scenes were a bit hard on the eyes, but all in all it was a smashing success. From here, the film will take its place in the Library of Congress as the first title in the newly created San Francisco Silent Film Festival Collection. Douglas Fairbanks in The Half Breed. Next was an experience I will have trouble describing accurately. Quite simply, it was one of the most breathtaking cinematic experiences I have ever had. The movie was Legong: Dance of the Virgins, a production of Bennett Picture Corporation run by actress Constance Bennett and her husband Henri de Falaise. Shot entirely on the island of Bali with a native cast, it tels the story of teenage love, betrayal and tragedy between Balinese ritual dances. Accompanying the film was the San Francisco-based Sekar Jaya gamelan ensemble, taking over the Castro stage with a full assortment of Balinese gamelan instruments. Along with them was the Clubfoot Orchestra, a small group of Western instruments, and together the two ensembles played a spectacular Balinese score accompanying the action and sacred dances onscreen. Just recalling it makes me tear up from the beauty of it all. This kind of experience is what makes the San Francisco Silent Film Festival so unique, and why I feel so honored to blog for them every year. I am hard-pressed to think of anything remotely like it, and I am so appreciative to have been a part of this once-in-a-lifetime experience. The same program from 1999. Next came a smaller offering, a sweet yarn called Gribiche about a young lower-class boy who is adopted by a well-intentioned wealthy woman so he might have an education. The boy is grateful, but misses his mother so much he begins to act out. Eventually it becomes such a problem that everyone in the house either leaves or is fired due to his behavior. Gribiche runs back to his old home and is reunited with his mother, and together they decide to go thank the woman for her kindness but keep Gribiche at home. The two families become good friends, and the movie ends happily. It is a lovely tale that runs way too long, but the movie has such a nice message that the length is somewhat forgiven. I enjoyed it very much. The House on Trubnaya Square, a Soviet movie about the adventures of a country housekeeper in Moscow, was a fun one for me, as I have spent a significant amount of time in Russia and am familiar with Russian comedic history and tradition. Many of the antics in this movie reminded me of some of the characters from popular Russian shows of the 1960s, and it was good fun for me. Some of the people around me were a bit put off by the screwball nature of the comedy, but being familiar with the style, I had a wonderful time watching it. The House on Trubnaya Square. The Joyless Street, made in 1925 and one of the programs to which I was most looking forward due to the appearance of Greta Garbo, proved to be a very long, very dark movie with some magnificent acting. Asta Nielsen, playing a desperate teenager in contemporary Vienna trying to make ends meet for her family, gives some of the finest silent acting performances I have seen. 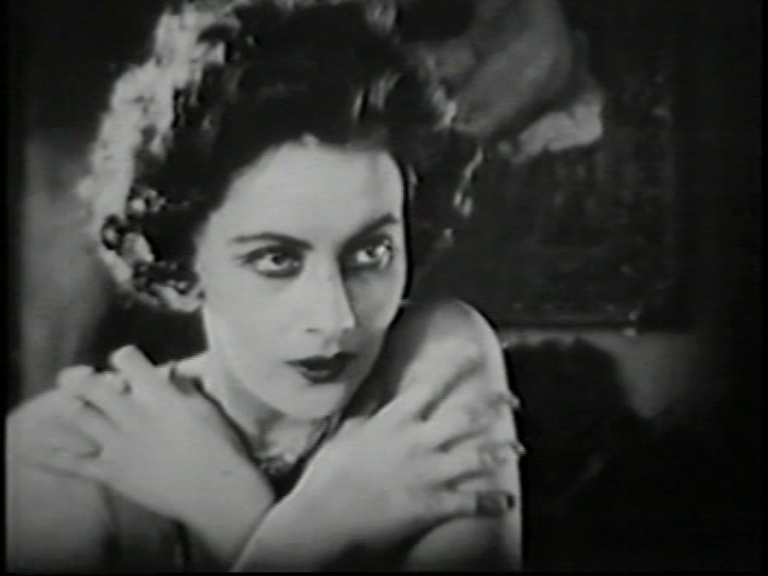 During one scene in which she is describing a traumatic experience, she appears almost possessed. Garbo is always good, and her eyes entrance the viewer. In all, the movie was very dark and rather monochromatic in tone (all 3 hours were extremely depressing), but it is worth it to see Garbo and Nielsen and to experience what Vienna was like immediately after World War I. The movie was banned by Nazi Germany and subsequently mercilessly edited, so little of the original film survives and the Filmuseum Munchen, who restored the film, had to do painstaking research to piece the restoration together. This may account for the difficulty in the storyline, but in all the Filmuseum did a beautiful job with the restoration. Today marks the last day, and highlights include The Last Edition and Kings of Silent Comedy! See you tomorrow! No pressure but just to show I so appreciate your blog and writing, I’ve nominated Backlots for a trifecta of blogging awards.